Too much caffeine may cause nervousness, irritability, sleeplessness and occasionally, rapid heartbeat. Not recommended for use by children under 18. Fresh mint flavored Blast Caps gum is fortified with Niacin, Vitamin B6, Vitamin B12 to increase alertness, focus and help prevent "crash." And it works fast - get a burst of fresh energy in as little as 5 minutes, any time, anywhere. Great Tasting, Convenient, And Packs A Punch! It's Great-tasting, Convenient and Packs a Punch! 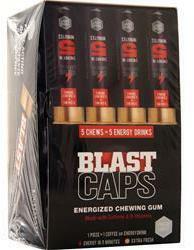 There's a big reason new Blast Caps chewing gum is packed in a unique, easy-to-use "shotgun shell" tube. It's got a real kick: 100mg caffeine in every piece - and 5 big pieces in every shell. That's the same as having 5 big energy drinks right in your pocket or purse -no cans, no hassle. Gum Base, Xylitol, Sorbitol, Caffeine (100mg), Niacin, Vitamin B6, Vitamin B12, Artificial Flavor, Sodium Carboxy Methylcellulose, Titanium Dioxide, Sucralose, Acesulfame Potassium, Brilliant Blue FCF, BHT, Magnesium Stearate. Fresh Mint This is a Buy 1 Get 1 FREE offer!